Over a millennium ago, Mornhavon the Black, heir to the Arcosian Empire, crossed the great sea hoping to conquer Sacoridia. Mornhavon and his armies were defeated—but not before their general had resorted to desperate, dark magic that rendered his twisted spirit immortal. Finally, Mornhavon was captured and imprisoned in Blackveil Forest, and the forest's perimeter was sealed by the magical D'Yer Wall. In the many centuries since, knowledge of magic has disappeared from Sacoridia due to the fear and prejudice of a people traumatized by the memory of Mornhavon's terrifying sorceries. Even the protective magic that created and maintained the D'Yer Wall has been lost, and the once-impermaeable barrier has been breached, allowing Blackveil's malignant influence to seep into the lands beyond once again. Karigan G'ladheon is a Green Rider—a seasoned member of the elite messenger corps of King Zachary of Sacoridia. But Karigan is no ordinary Rider, for she can traverse the barriers of time and space. Because of this extraordinary ability, she was able to transport the spirit of Mornhavon into the future, buying precious time for her country. 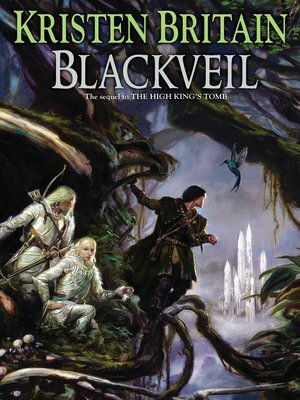 During the window of relative safety, King Zachary decides to send Karigan and a small contingent of scouts, accompanied by a small group of Eletians—a magical race who once lived in the lands now tainted by Mornhavon's magic—into Blackveil Forest. Though Mornhavon is gone, the forest is still a treacherous and unnatural place filled with monstrous creatures and deadly traps. Plus, no one knows how far in the future Mornhavon has been sent—Ten years? One? Maybe even less. And unbeknownst to the band of Eletians and Sacoridians, another small group has entered the forest—Arcosian descendants who have kept Mornhavon's dark magic alive in secret for centuries, and who now plan to avenge their long-ago defeat by bringing Sacoridia to its knees.